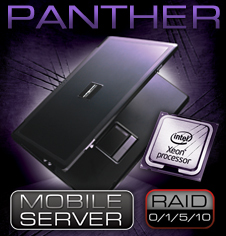 LGA1366 Processors in its line of Mobile Servers. performance and ability to function for extended periods of time. and server performance according to demand from running applications. generations of Intel Xeon based servers within the same pool. existing business applications to users wherever is required. office need a server to share data, run applications and virtualize. and under the most demanding environments. minimal!" explained Eurocom president Mark Bialic. with no drop in performance. - Can be hand carried on a plane for Secure and Fast Deployment. - Low energy consumption allows for high computing density. Linux, Solaris, Microsoft Server 2008R2.